You don’t have to be a college football fan to enjoy this story, but we are, so that makes it even better. Clean the World was honored in Orlando as “Holler-Classic Heroes” during the Oct. 6 Conference USA clash between the University of Central Florida Knights and the University of Alabama-Birmingham Blazers. The UCF-UAB game was broadcast nationally on ESPN. UCF won the football game rather handily, 42-7. But the real action took place during the third quarter. Clean the World co-founders Shawn Seipler and Paul Till were called onto the field during a TV timeout and were introduced as “local heroes” for their work on behalf of people worldwide who are in need of soap and improved hygiene education. Shawn and Paul smiled and waved as an announcer shared the Clean the World mission of helping to fight preventable diseases with simple access to bar soap. The sell-out crowd at UCF’s Bright House Networks Stadium seemed to appreciate the message and, hopefully, will support our cause. 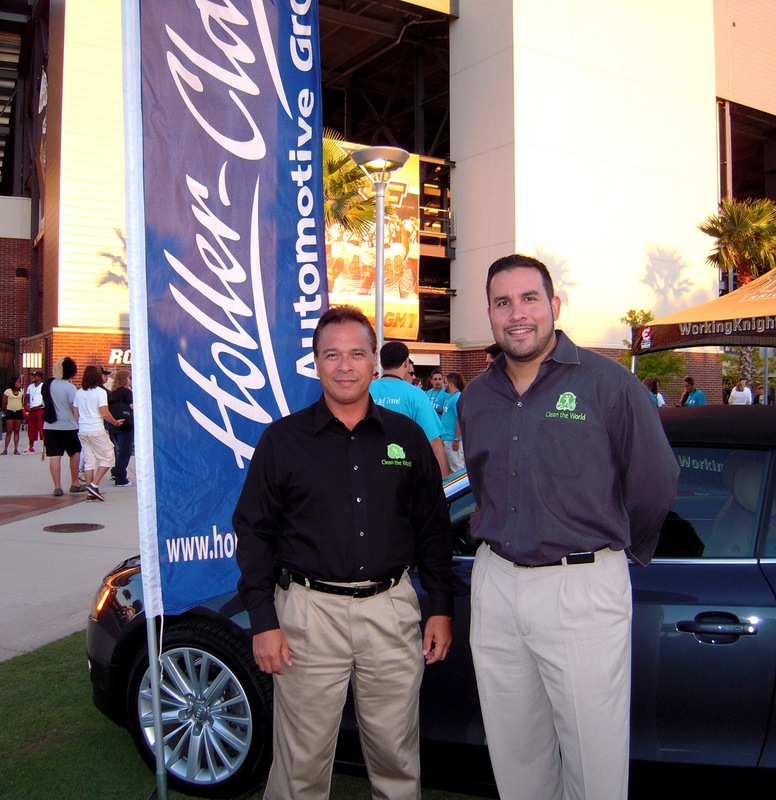 The honor was sponsored by Holler–Classic, an Orlando-area auto dealership group. We are humbled and deeply appreciative of the recognition, but wish to thank all of our volunteers for your continued support of Clean the World. Your contributions of time and talent, more than anything, will be the true measure of our success – and a true light of hope for people desperately in need of soap and hygiene supplies. If you’d like to donate to Clean the World, or if you know of a person or organization who would like to make a financial donation, please click here. Again, your contributions help support our efforts and will put soap in the hands of children and families whose lives depend on your generosity. Thanks to Holler–Classic for honoring us as Holler-Classic Heroes, and thanks to all of you for helping Clean the World.